The Igor Zabel Association for Culture and Theory, Archive Books, and the ERSTE Foundation presented the book Extending the Dialogue at Archive Kabinett, with Ekaterina Degot, Antonia Majaća, Urška Jurman, and Christiane Erharter. The book includes essays by Igor Zabel Award Laureates, Grant Recipients, and Jury Members (2008–2014) and offers a collection of urgencies and agencies in art history, art writing, and art and cultural production in Central, Eastern, and South-Eastern Europe. It will be introduced by the co-editors Christiane Erharter (curator and project manager at the ERSTE Foundation) and Urška Jurman (programme manager of the Igor Zabel Association for Culture and Theory). Ekaterina Degot will be speaking about perverse decolonization of Eastern Europe – the perverse use of emancipating rhetoric, especially in Russia and Eastern Europe in recent times. 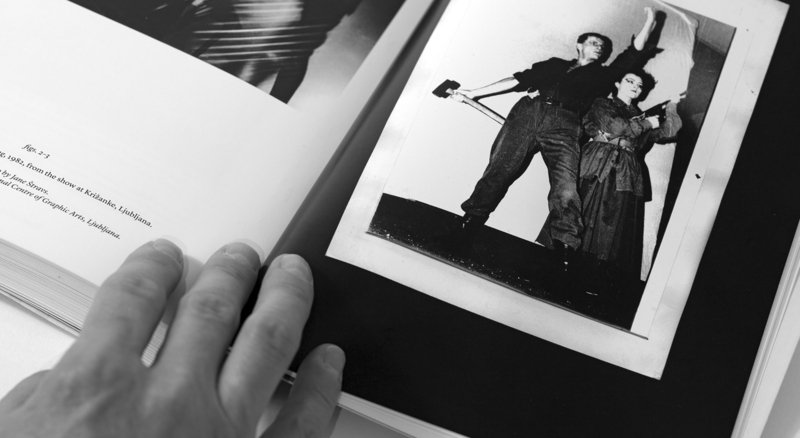 Antonia Majača will – as an ‘outside insider’ – present her comments on the book and address the political and aesthetic implications of the trope of ‘two totalitarianisms’ in the context of (post)cold-war cultural politics and its resonances in what is today referred to as ‘global art’. Contributions by Edit András, Fouad Asfour, Keti Chukhrov, Karel Císař, Ekaterina Degot, Maja Fowkes and Reuben Fowkes, Alenka Gregorič, Daniel Grúň, Sabine Hänsgen, Tímea Junghaus, Klara Kemp-Welch, Miklavž Komelj, Lev Kreft and Aldo Milohnić, Kirill Medvedev, Piotr Piotrowski, Jelena Vesić, Raluca Voinea, WHW / What, How & for Whom. Given the authors’ diverse backgrounds, their writings express a variety of concerns and approaches. The book is a survey of the pressing issues that stimulate these authors’ scholarly, curatorial, and cultural investments and so provides a referential, if fragmented and incomplete, picture of current conditions of art and culture in the region.